The all-out effort by Japanese Prime Minister Shinzo Abe to print money, stir up inflation, devalue the yen, blow asset bubbles, and pile on even more government debt – a newfangled religion called Abenomics – is bearing fruit. But the primary objective, creating a trade surplus to crank up the real economy, is failing miserably. Exports rose 7.4% in June, but imports jumped 11.8%, and the balance of trade swung from a surplus in June 2012 to a deficit of ¥180 billion ($1.8 billion). By US standards, that would be great: a deficit so small that it would disappear in statistical noise. We’d jubilate because we haven’t seen anything this good since the no-holds-barred offshoring boom took off in earnest in the early 1990s. 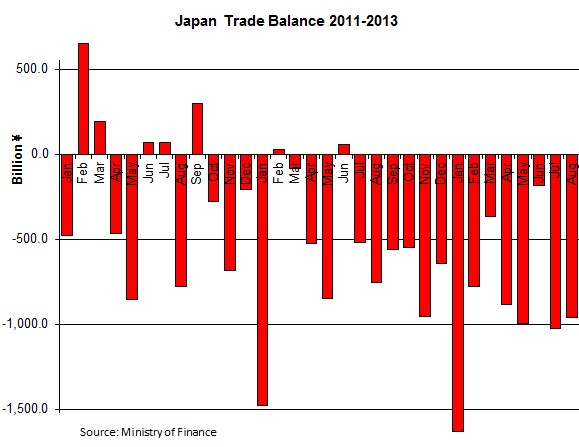 But Japan’s June trade deficit confirms a terrible trend – for an economy that has become dependent on a trade surplus. In June 2012, Japan had a surplus of ¥60.3 billion, one of the only two surpluses of the year. In June 2011, it had a surplus of ¥69.3 billion, one of five surpluses that year. By that time, the shutdown of its nuclear reactors had already started. In June 2010, before the shutdowns, the trade surplus was ¥670 billion. Even during the financial crisis, when major trade aberrations occurred, Japan had a trade surplus in June. Since the beginning of the data series in 1979, Japan has always had a trade surplus in June. So June 2013 became the first modern June on record when Japan ran a trade deficit. It set another record: it was the 12th month in a row of trade deficits. And another record: for the first half of 2013, the trade deficit jumped 70% from the same period last year to ¥4.8 trillion! Japan has entered a new frontier. June was the worst June ever, May the worst May ever, April the worst April ever….. The deterioration has been systematic, unrelenting, and fierce. The chart, going back to 2011, shows how the trade deficit in each month of 2013 deteriorated from the equivalent month in 2012; and how it had deteriorated in 2012 from the equivalent month in 2011. Japan Inc. has started digging this hole some time ago by offshoring production, for two primary reasons: the corporate search for the greener grass, namely lower costs of labor; and increasingly the corporate desire to be geographically closer to customers – the same strategies that US corporations have long ago perfected, with brilliant results for the US job market. In that respect, Japan has been a laggard. The auto industry is a prime example: when Toyota builds a plant in China to produce models for the still booming Chinese market, Japanese suppliers, the lucky ones that haven’t yet lost that business to Chinese suppliers, are under pressure to follow. Some of their products, particularly components, then filter back into Japan. While monkeying around with the yen might jiggle the cost-of-labor equation, it doesn’t alter the strategic desire to be located in the middle of the largest market for cars on the planet. China is Japan’s largest trading partner. Nearly a quarter of Japan’s exports head to China, nearly a quarter of its imports come from there. The two countries might be at each other’s throats and kick each other in the groin and hate each other as they grapple with island issues, historic massacres, and other debacles, but they do trade. Trade with China is murky and convoluted. About a third of Japan’s exports to China are transshipped through Hong Kong, while imports from China are not, which skews the numbers. So we have to consider China and Hong Kong together. Combined exports rose 5.7% to ¥1,398.6 billion but combined imports jumped 14.4% to ¥1,341.3 billion, for a surplus of only ¥57.3 billion – “only” because that’s down 62% from the surplus in June 2012 and down 82.3% from the surplus in June 2007. Japan’s second largest trading bloc, “North America” – which the Ministry of Finance defines as the US and Canada, while Mexico belongs to “Middle South America” – was one of the bright spots for Japan. Exports soared 14.5%, to ¥1,210 billion, imports jumped 16.9%, but from a measly base, to ¥568 billion. So the trade surplus rose 11.5% to ¥529 billion. Opposite in Japan’s third largest trading bloc: Exports to the EU rose 8.4% (from dismal levels in June 2012), imports jumped 16.1%. The trade deficit more than doubled to ¥89.3 billion. The usual suspects – imports of crude oil and LNG – have been blamed for Japan’s trade debacle, and they’re up: the category of Mineral Fuels rose 7.3%. But there are other culprits. Imports of food rose 6.2% and raw materials 8.7% (includes wood, iron, etc. to feed a construction boom in the Tokyo area). Chemicals rose 8%, the subcategory of medical products jumped 19.7%. Manufactured goods were up 9.9%. Machinery soared 22.5%, Power Generators 37.6%. Electrical machinery jumped 19.6%, of which semiconductors skyrocketed 44.8%. Transportation equipment up 31.0%, furniture 20.2%, apparel 25.5%. Part of it was due to the yen that dropped 22% against the dollar from June last year and thus inflated the value of imports. Part of it was the wealth effect and corporate optimism that induced Japan Inc. and wealthy individuals, flush with freshly printed money, to splurge. Part of it was structural as Japan’s manufacturers accelerated their efforts to offshore production. It supported the economies of China, Thailand, Bangladesh, Europe, etc. – at the expense of the Japanese economy. A crippling birth defect of Abenomics.